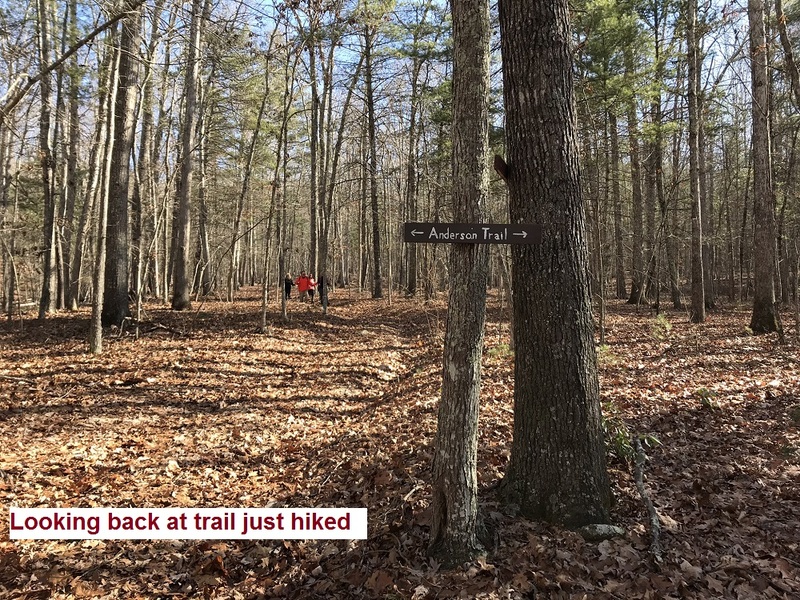 IMPORTANT NOTE: Several parts of this hike, including the parking area, are located in a Virginia Wildlife Management Area, which requires a permit. The Virginia Department of Game and Inland Fisheries (DGIF) requires an Access Permit for visitors to department-owned Wildlife Management Areas (WMAs) and public fishing lakes for anyone age 17 and older, unless they possess a valid Virginia hunting, freshwater fishing, or trapping license, or a current Virginia boat registration. 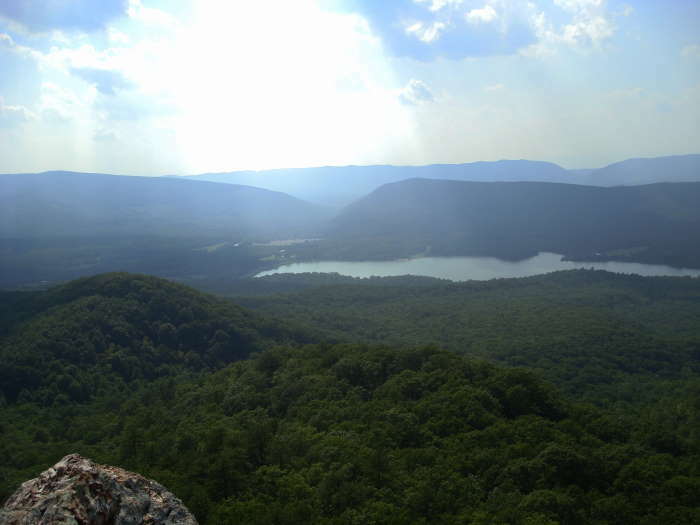 All hikers who are age 17 and older who do not possess one of these permits will need an access permit for this hike. You can find information on obtaining a permit here. 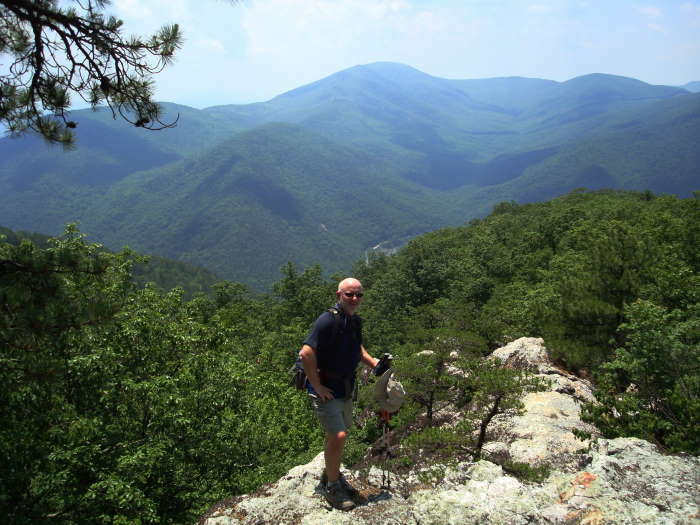 This is one of the best but underused hike loops in Virginia. Perhaps it is due to the access permit, but this hike is well worth the current $4 daily fee. It could be because it is a tough trail and the directions are sometimes confusing – hopefully this description will help. 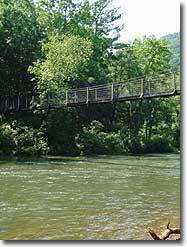 Or maybe it is because the scariest part of the entire loop is at the beginning and end: crossing the appropriately named Swinging Bridge over the Maury River – can’t help you there! 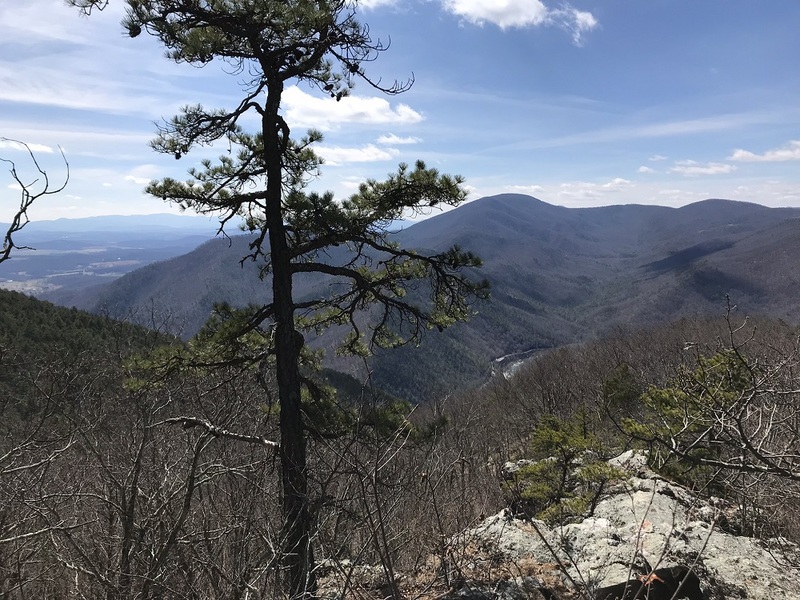 But this hike features three different vistas with wonderful views that would each be worth hiking to on their own, and each view is in a different direction. 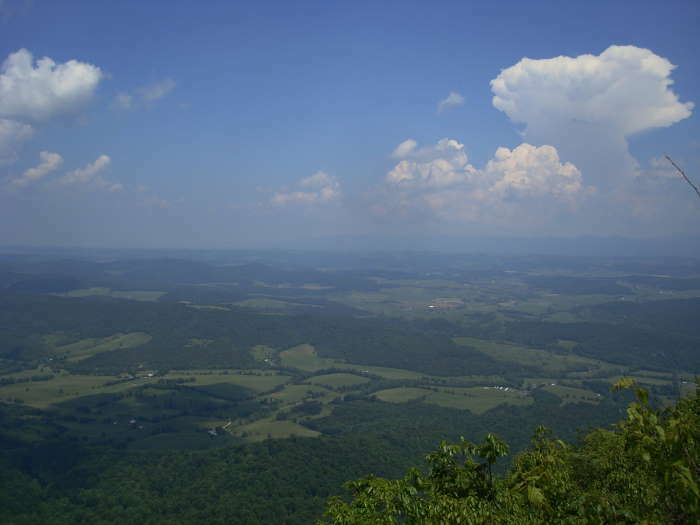 For these reasons, Jump Rock is one of the best day hikes in central Virginia. 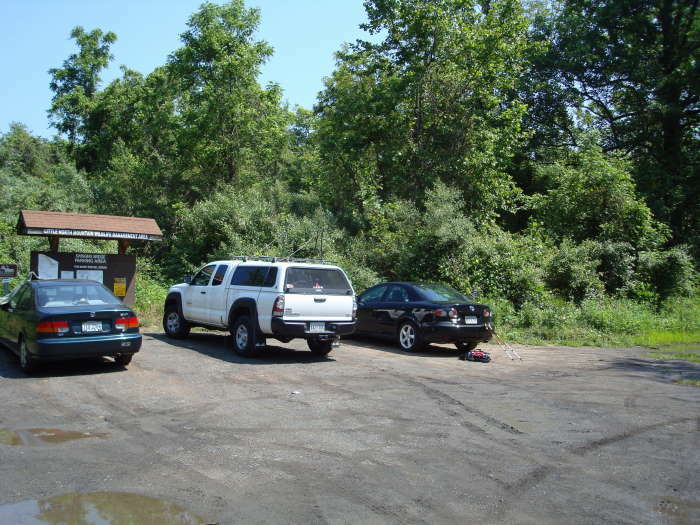 Mile 0.0 – Park at a gravel lot on the north side of Virginia Route 39. 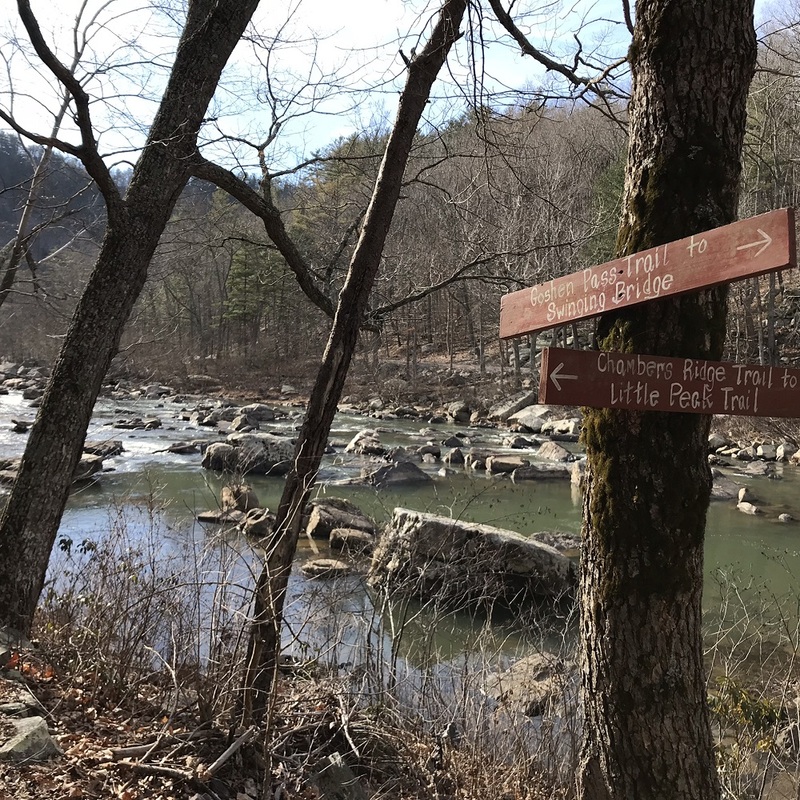 This lot is unmarked from the road, but if you are coming from the east through Goshen Pass (highly recommended, as it is arguably the prettiest 5 miles of driving in the state) you can see the swinging bridge crossing the Maury River just before the gravel entrance to this lot. The river swings away from the road just before the lot entrance. 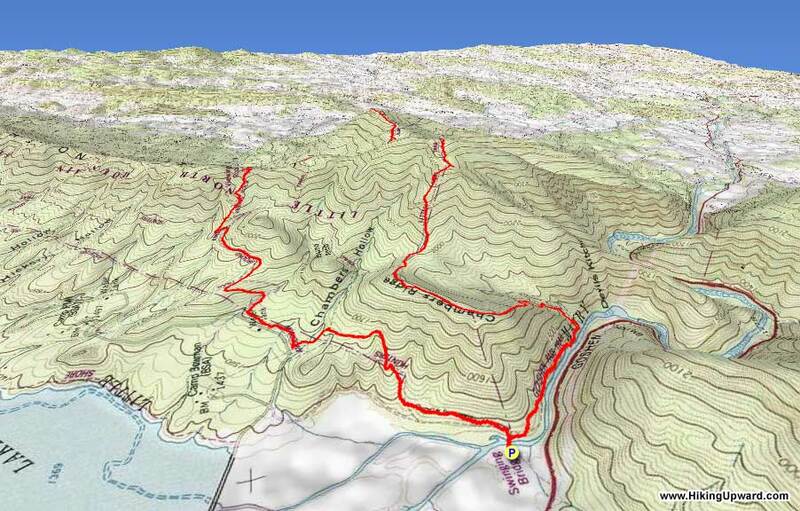 Mile 0.1 – What hike sports the scariest part right at the beginning? Some may claim this one does, as the Swinging Bridge over the Maury River– a steel suspension bridge that has quite a bit of movement to it. But it is improved over several years ago! Follow the instructions, though: no more than three on the bridge at a time. After the bridge, take a right onto the Maury River Trail, which parallels the river for its entire distance. 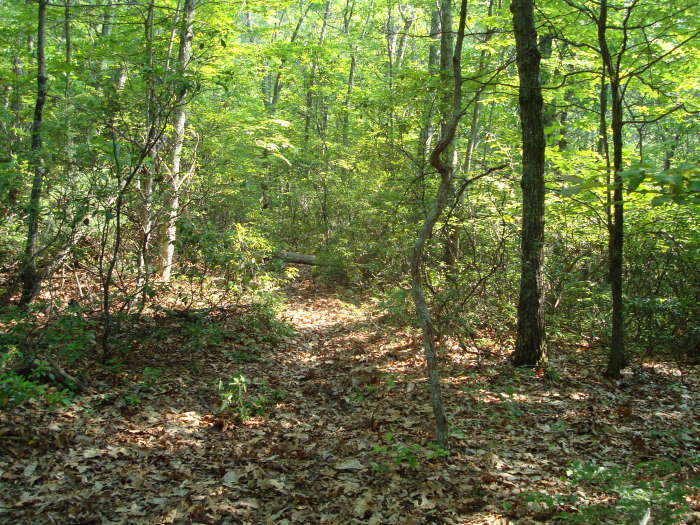 The trail enters the Goshen Pass Natural Area Preserve, managed by the Virginia Department of Conservation and Recreation. Mile 0.7 – Turn left onto the Chambers Ridge Trail, which ascends to the left. It should be marked by a sign, but keep an eye out for it in case the sign is gone. Mile 0.8 – After several switchbacks, the trail climbs along a large cliff that rock climbers use. Mile 1.0 – Check out the small waterfall to your right. 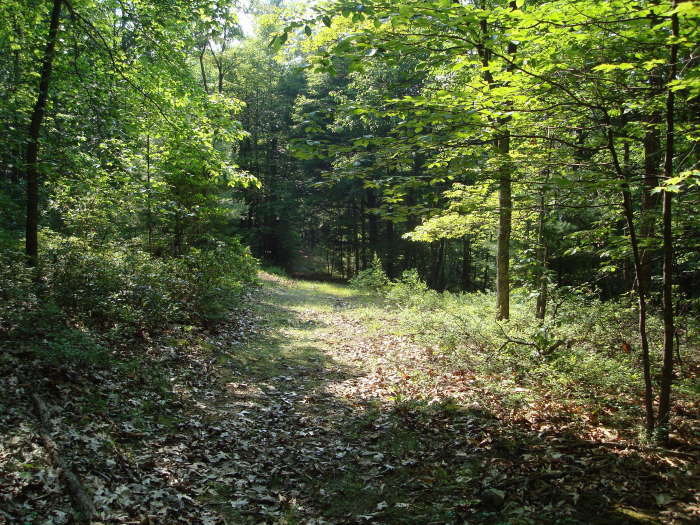 Mile 1.4 – The trail passes an apparent campsite, but camping is not allowed inside the boundaries of Goshen Pass Natural Area Preserve. 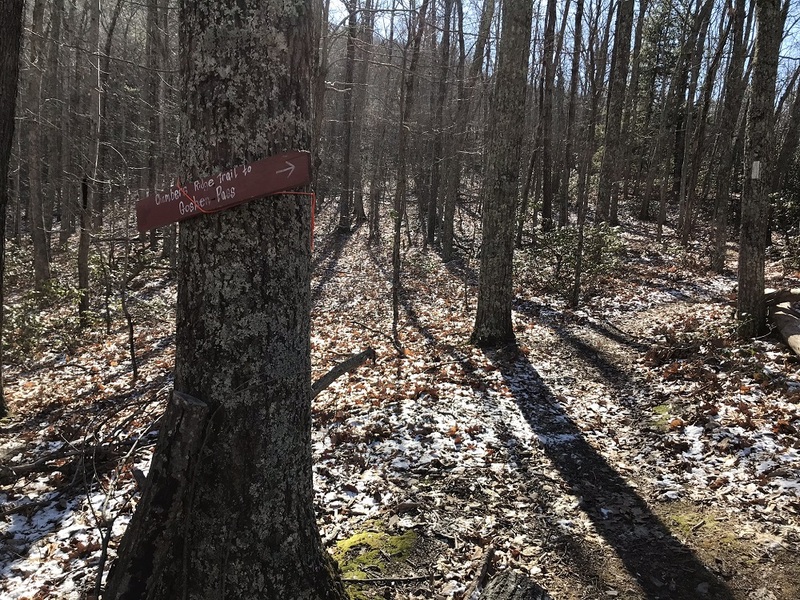 Mile 1.7 – The trail climbs onto Chambers Ridge and continues across the ridge. 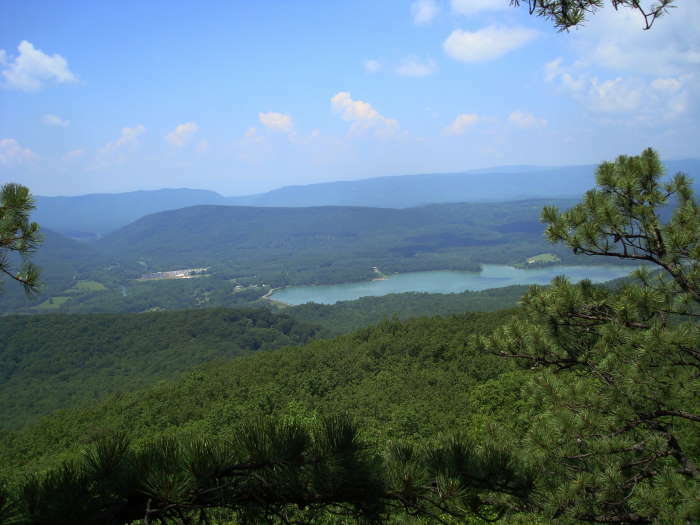 At the top of the ridge, you will be hiking along the border between the natural area and the wildlife preserve. 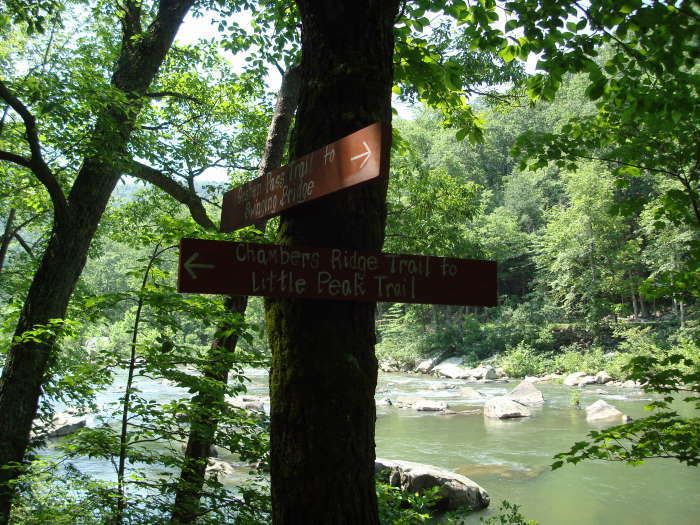 Mile 2.2 – After dropping off Chambers Ridge and turning east, the Chambers Ridge Trail ends where it meets the Little Peak Trail. Turn right here and climb. (Going left would loop you back to your vehicle, as long as you keep taking left turns at every intersection.) This portion of the trail is the steepest part of the hike. 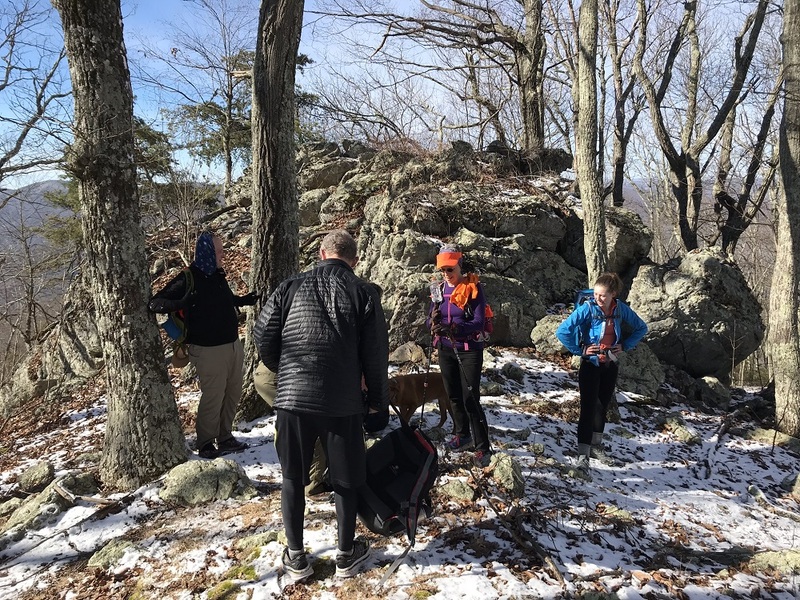 Mile 2.6 – After climbing steeply, the trail levels off briefly, and it might be confusing which way to go. Head straight ahead. Mile 2.7 – Ahead of you lies a rock face. There is a fissure in the face to the left of straight that gives relatively easy access to the next level. It becomes more obvious as you get closer, but is a short, steep ascent. Mile 3.0 - Once on top, to your right is a large rock. Do not pass by this! 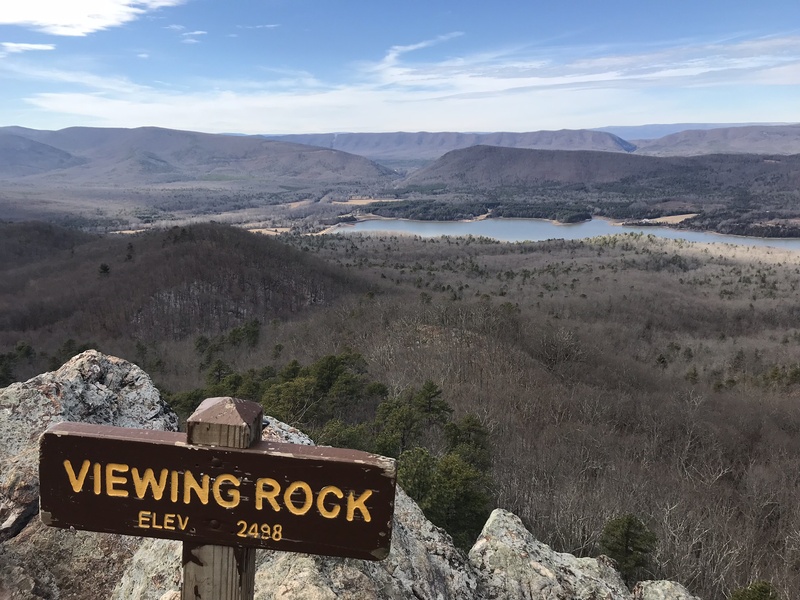 Take a right and go out onto the rock for a short distance to get a wonderful view to the southeast, including Route 39 as it weaves through Goshen Pass next to the Maury River. After enjoying this view, retrace your steps, and then follow the ridge north. At this point, you leave the Natural Preserve and re-enter the state hunting lands. The ridge elevation drops slightly, then climbs again through mountain laurel. It may sometimes be hard to follow the established trail, but head for the top of the ridge. 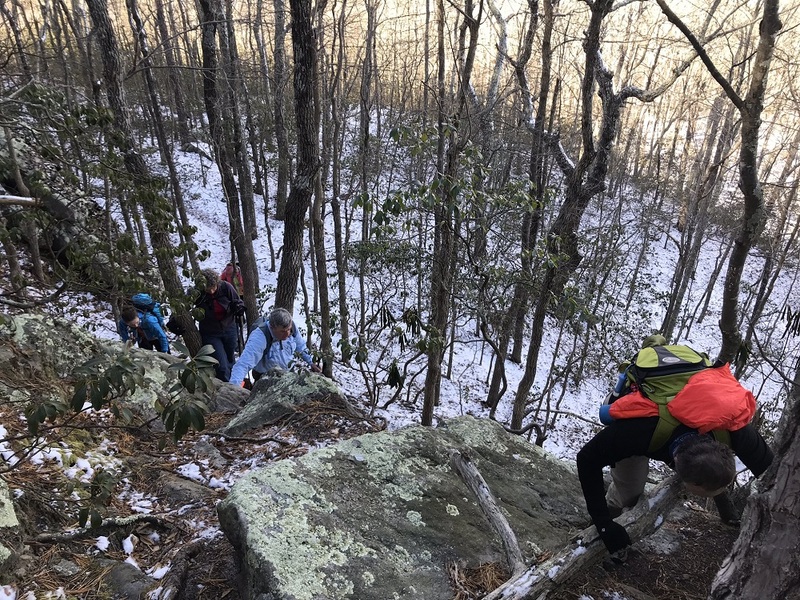 After climbing over a high point on the ridge, Jump Rock is visible to the right during the winter, and it looks like a much tougher climb than you will actually experience. 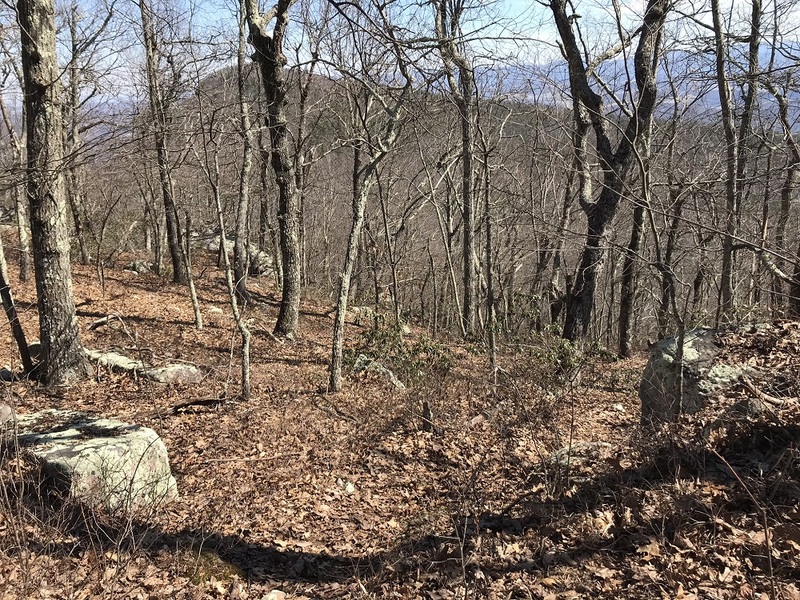 Mile 3.5 – After you drop off from the ridge’s high point, look for a break in the rocks to your right. 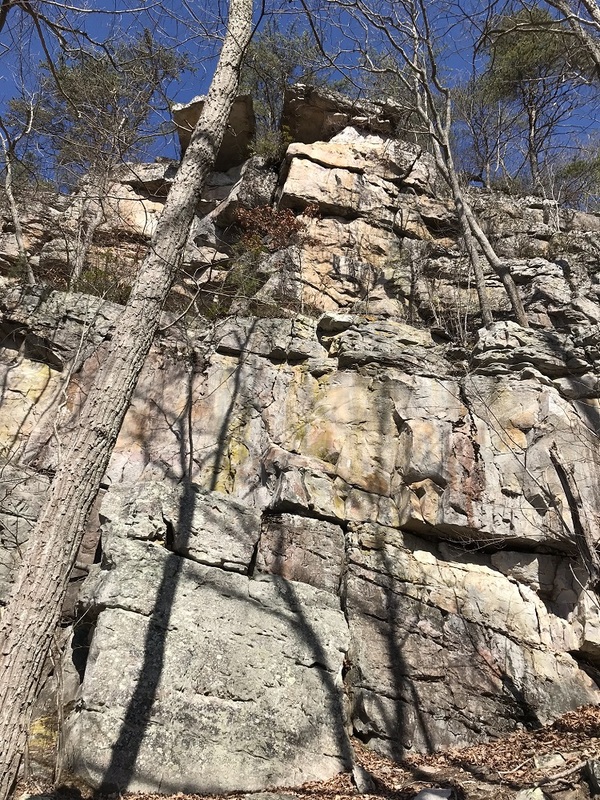 The trail is not marked here, but it drops off from the ridge, sometimes steeply and without a clear route, towards Jump Rock. 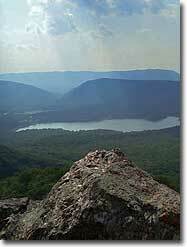 What you need to know is that you will descend into a gap separating the ridge you just hiked from Jump Mountain. Keep heading in the generally northbound direction as you descend. 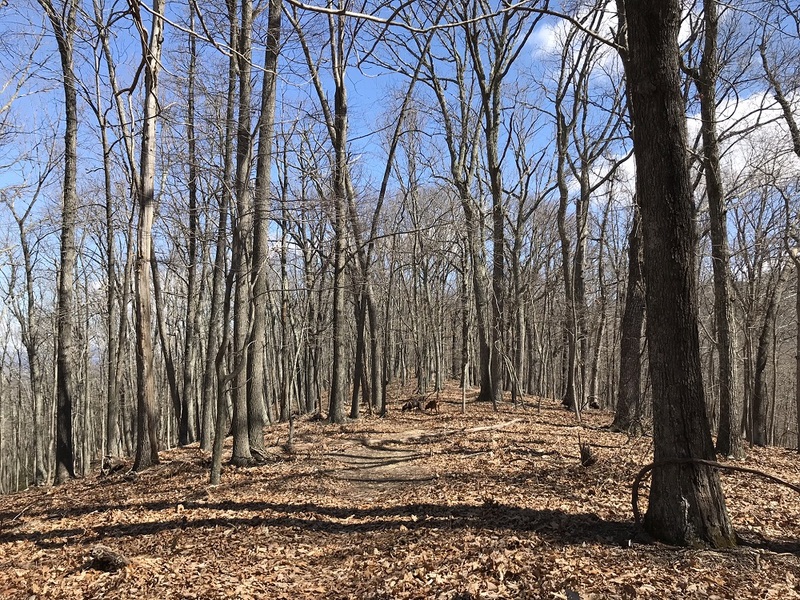 There is a visible trail on the northern end of this gap, marked by white blazes, and you will likely find signs for Jump Rock along this trail placed by Boy Scout troops or Cub Scout packs that camp at the nearby Goshen Scout Reservation. 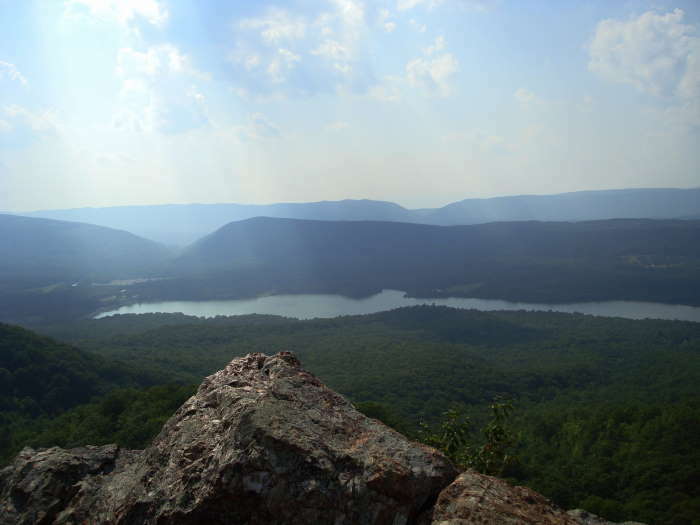 Mile 3.6 – Look for a campsite on the northeastern end of the gap between the ridge and Jump Mountain. There are likely to be several trees with yellow or gold paint on them in a line, as this marks the boundary of the hunting lands. If you see these, head to the right (east). A clear trail ascends Jump Mountain from that campsite. Follow the trail to the summit. 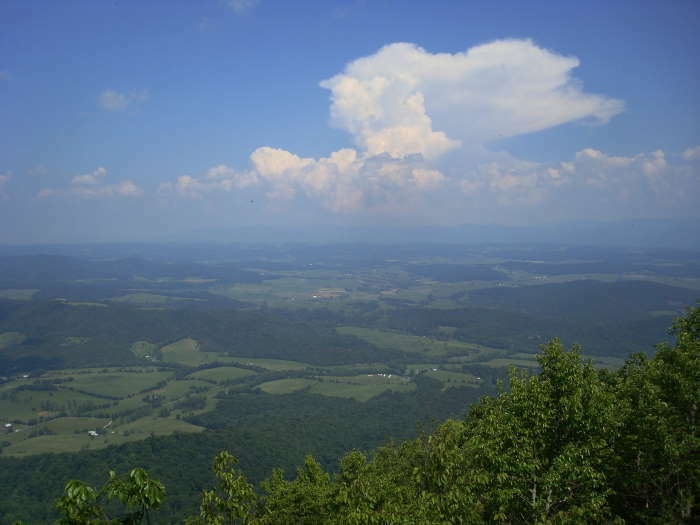 Mile 4.3 – There are several viewpoints from the top of Jump Rock, with views that include six different federally designated wilderness areas, as well as Elliot Knob (the highest point in the George Washington National Forest), Massanutten Mountain, Shenandoah National Park, and south along the Blue Ridge Mountains. Mile 5.0 – Follow the trail back down into the gap, but stay on the trail as it rides the ridge to the right of where you came down. Follow the white blazed trees onto the next ridge, north of where you dropped off. Mile 5.5 – When the ridge turns north, the trail continues on the ridge. This is the Tuscarora Trail and is regularly marked with white blazes. 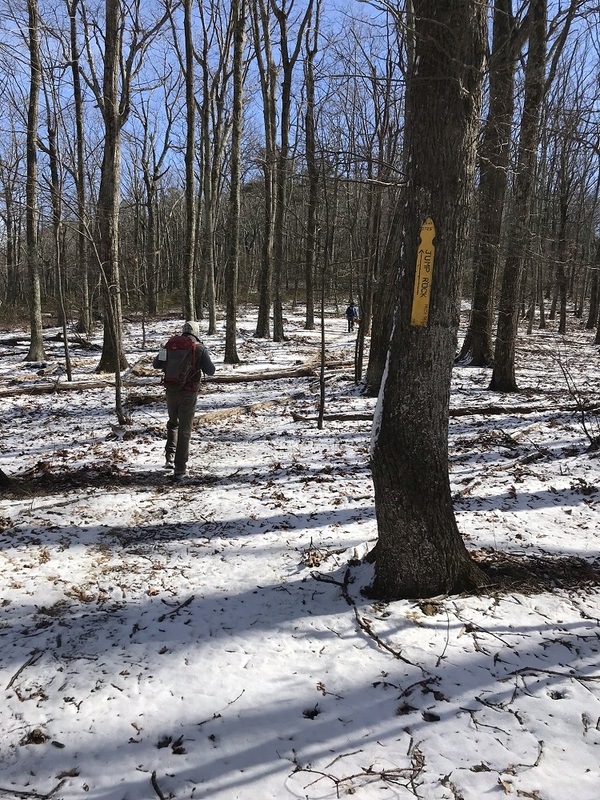 Mile 5.8 – Continue on the Tuscarora Trail until you come across a double white blaze and possibly a sign facing the opposite direction. This is the intersection with the Viewing Rock Trail. Take a left here and descend for a short time. Mile 5.9 – Take a right where the trail splits. There is probably a trail sign here, created by a Boy Scout troop or Cub Scout pack. This will take you to Viewing Rock, which looks west over Lake Merriweather and the Boy Scout summer campgrounds at Camp Goshen (hence the scout signs). Behind the lake is Knob Mountain and the gap that Virginia Route 39 uses to head west towards the town of Goshen and Warm Springs. This is the last of three wonderful views on this hike, so soak it in before descending the mountain. When you are ready to go, head back a few feet to the fork that brought you here, take a right, and continue descending on the Viewing Rock Trail. Mile 6.6 – The trail levels off and ahead looks to ascend slightly. Here you intersect with the Hunter’s Trail. Take a left here onto the Hunters Trail. 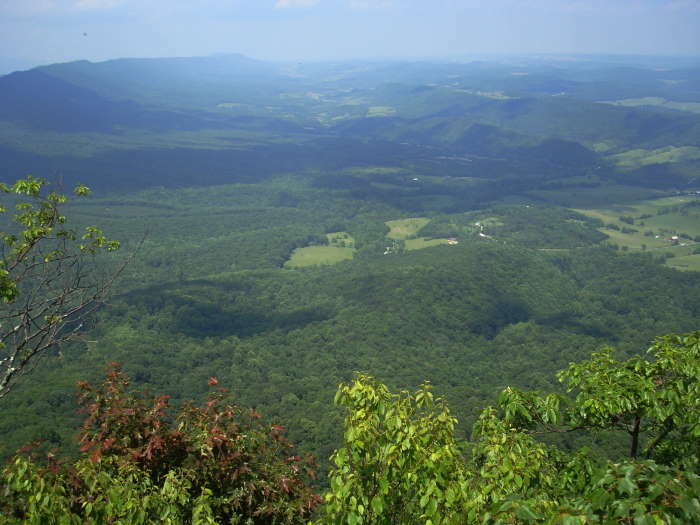 Mile 6.7 – The Hunters Trail seemingly ends after a very short distance, when the Round Knob Trail comes in from both the left and the right. Turn right onto the Round Knob Trail. Mile 7.3 – The Shale Pit Trail comes in from the right. Avoid that, and stay to the left. Mile 7.5 – Shortly after crossing a stream the trail comes to an intersection with the Anderson Trail. Take a left on the Anderson Trail, paralleling a gravel road about 100 yards away. The Boy Scout camp is on the other side of the gravel road. 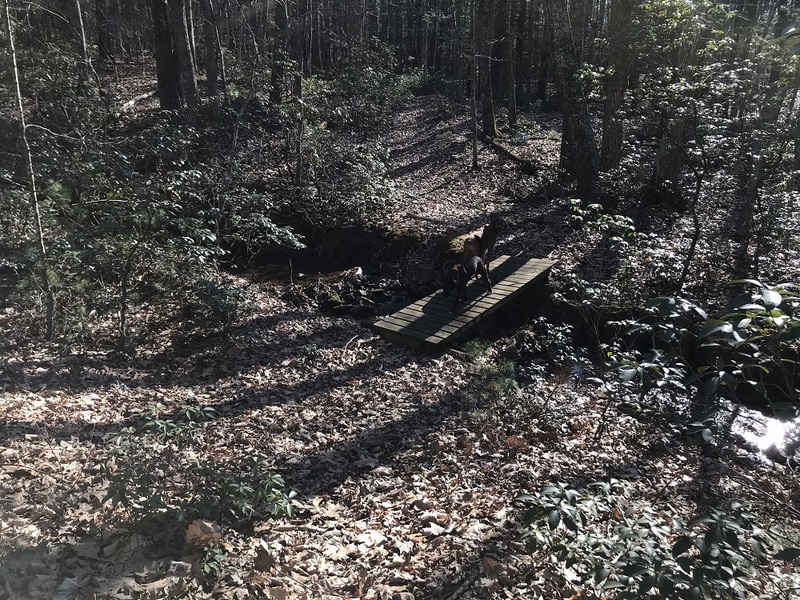 Mile 8.0 – Cross a small bridge spanning a streambed, then merge into the Little Peak Trail. Stay left, paralleling the streambed. 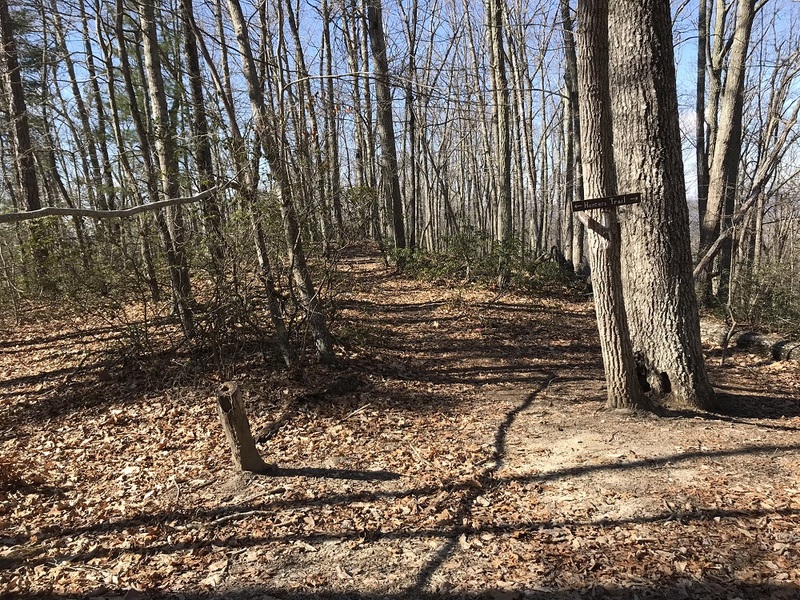 Mile 8.1 – The Hunters Trail reappears (remember it from earlier in the hike?) and is marked on a tree with several signs. Take a right onto the Hunters Trail. (The Little Peak Trail heads upslope to connect with an early portion of this loop.) 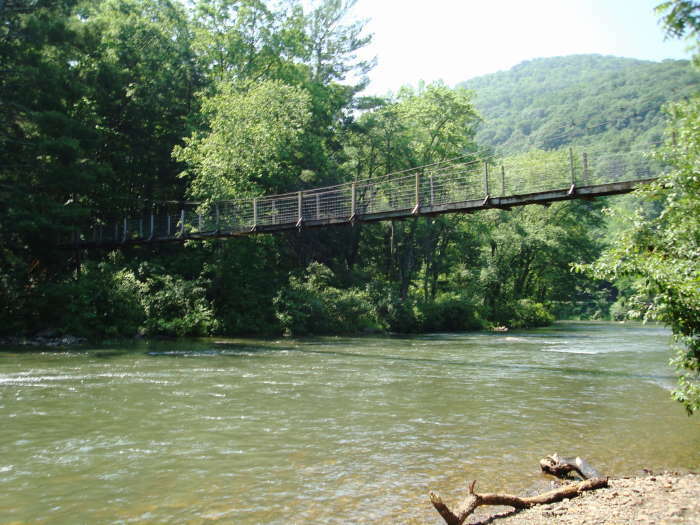 The Hunters Trail takes you back to the Swinging Bridge. 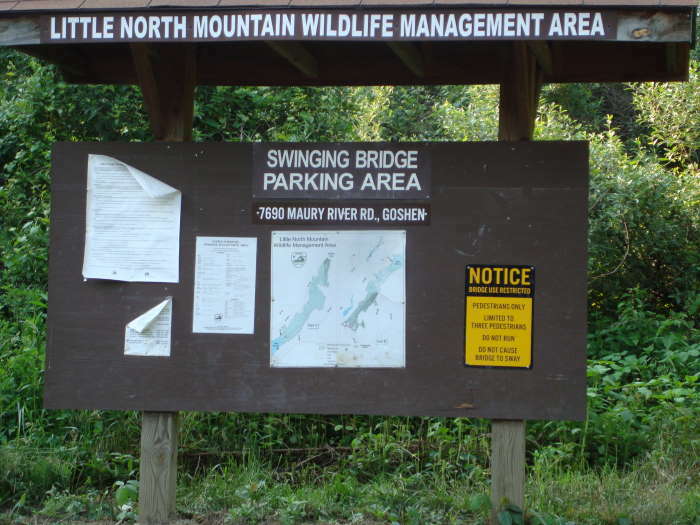 Mile 9.0 – Exciting times at the end of the hike as you cross the Swinging Bridge to return to your vehicle. Mile 9.1 – Return to the parking lot. Hike was one of my favorites I've done in Virginia! The views were gorgeous, especially in the winter. The uphill portions were tough but a good workout overall. Super fun going over the swinging bridge. The path was a bit difficult to follow at the top of the second ridge and towards Jump Rock, but if you have a sense of where you're headed, it will be fine. Going down, the path was pretty muddy/wet, as it had rained recently. 3.5 stars... pretty rough going in spots with plants overtaking sections of the trail, and some steep ups and downs. 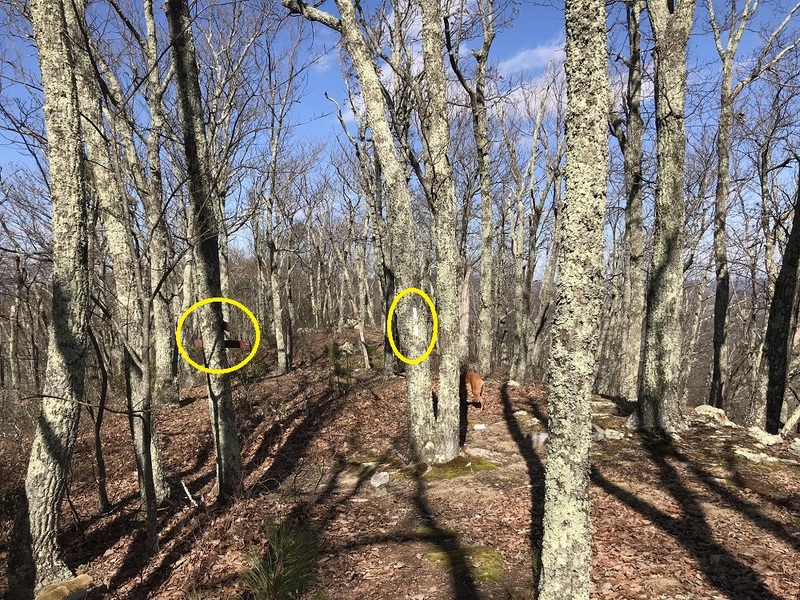 The bushwhacking part was a bit of a wild goose chase for us--we couldn't find the trail based on the original trail description or the detailed description in Chris' 3/27/17 comment. Ended up opening AllTrails to find the trail way down the hill. Loved the solitude (saw zero others, and only two other cars were in the lot when we finished), loved the swinging bridge (dog wasn't quite sure, but it was safe for her to cross), and the woods were beautiful. Mountain laurels were blooming. Humans and dogs had a few ticks but overall it wasn't as ticky as we expected. Because of the jungle sections this hike is probably a better winter hike. Overall a really enjoyable day! We hiked this on Memorial Day 2017 and expected to see someone else on the trail, but never did. There were lots of people putting in kayaks and canoes into the Maury River, but still plenty of parking. The area must have experienced very heavy rains in recent weeks, as the first .8 miles had lots of downed trees, brush, and standing water. The Maury was flowing quickly and made us envious we didn't make it a kayaking day rather than a hiking day. At one point the trail was fully consumed by the Maury and we debated turning back. There was always a rock or bank to hop on and that made for slow-going. There were other places where the brush carried by water completely obscured the trail. Got in a good workout after an initially very slow start. 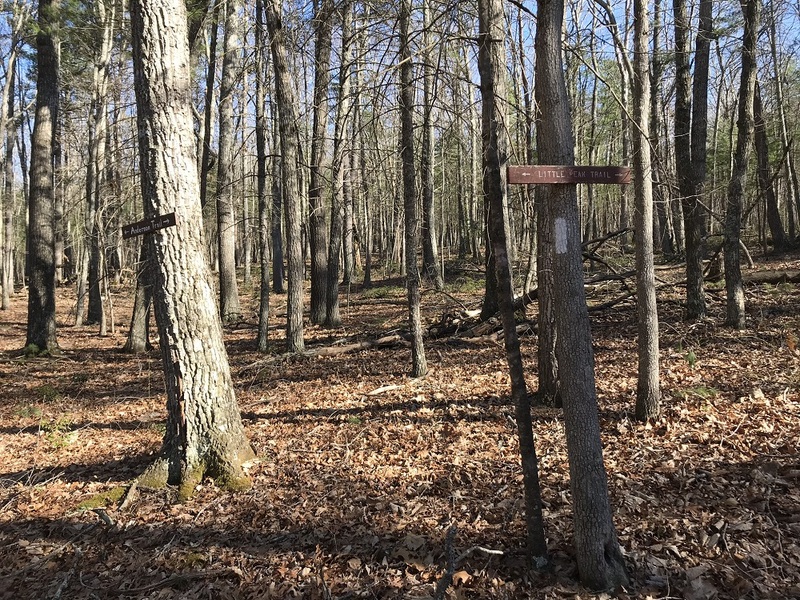 If you want clear trails, easily recognizable markers, and un-obscured views, this might not be the trail for you. We never felt lost, but there were several times on the way to Jump Rock that I looked around thinking, hmmmm.... We opted to just do an out and back to Jump Rock and retrace our steps back down. That was probably a mistake because of the steepness of the trail. All in all, it was a decent hike and we had fun with the woods all to ourselves. The drive in was very pretty and we stopped to relax at the rest spot on 39. Bring lots of water. We had 4 liters each on a warm day (~83F at the base) and that was just enough. Thanks for the original post...it was very helpful as this is not the easiest trail to follow. I would like to update future hikers a bit with a few updates which might make it a bit easier for people to follow. As most of the reviewers have stated, it can be a challenge to follow as there are a lot of different colored blazes, signs and decision points. The hike took us 6 hours round trip including about an hour at the top and at a lunch spot. 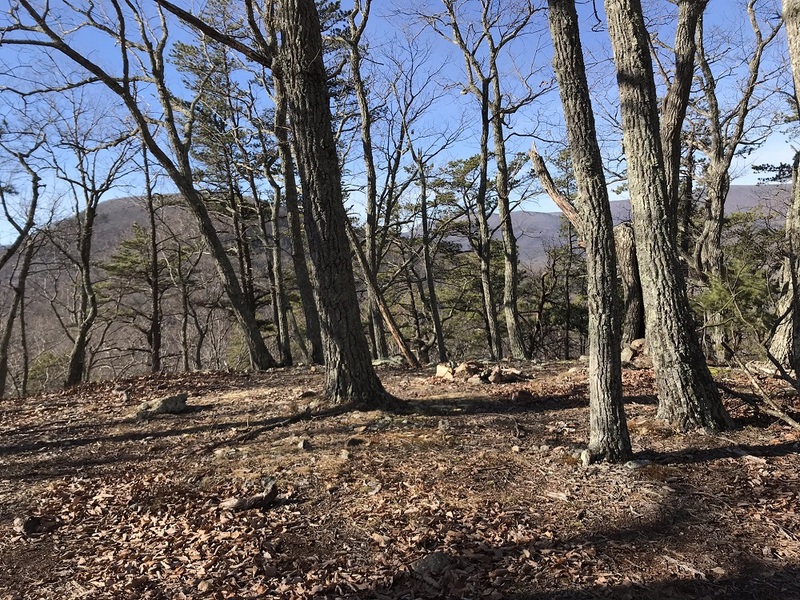 Spring time is a great time to complete this hike because you can still see through all the trees and have a view of Lake Merriwether and the surrounding mountains. We did this hike with our Rhodesian Ridgeback who had no problem with the hike. It is no fairly strenuous hike. We saw one deer and no other wildlife until we saw hawks from the top. 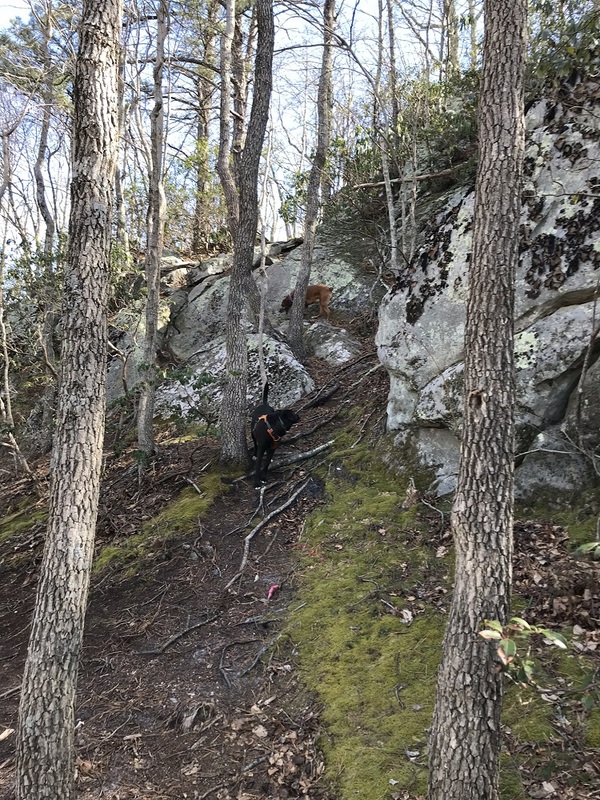 Following are a few notes to help stay on the trail to Jump Rock. 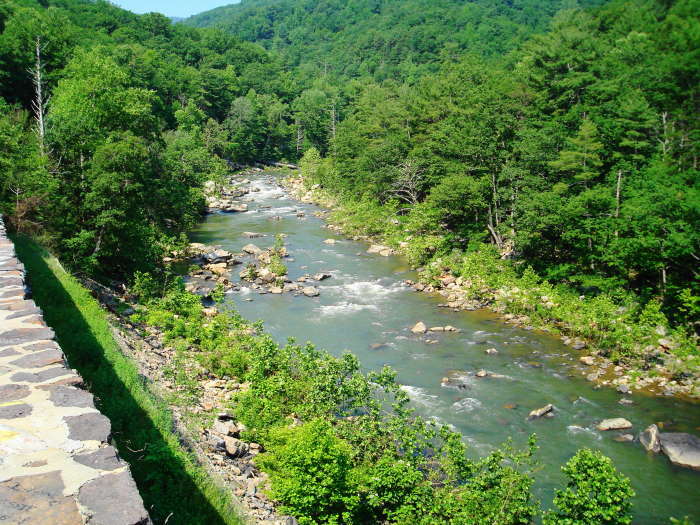 The initial part of the hike starts along the Maury River going into Goshen pass from the Swinging Bridge. You make a left when you get to a sign marked "Chambers Ridge Trail". The single white blazes are easy to follow on this portion of the trail. Once you reach the top of the first ridge (Chambers Ridge) there is a nice level walk along the top of the ridge. You then descend a bit into a saddle between ridges and reach your first decision point....the trail splits left/right. 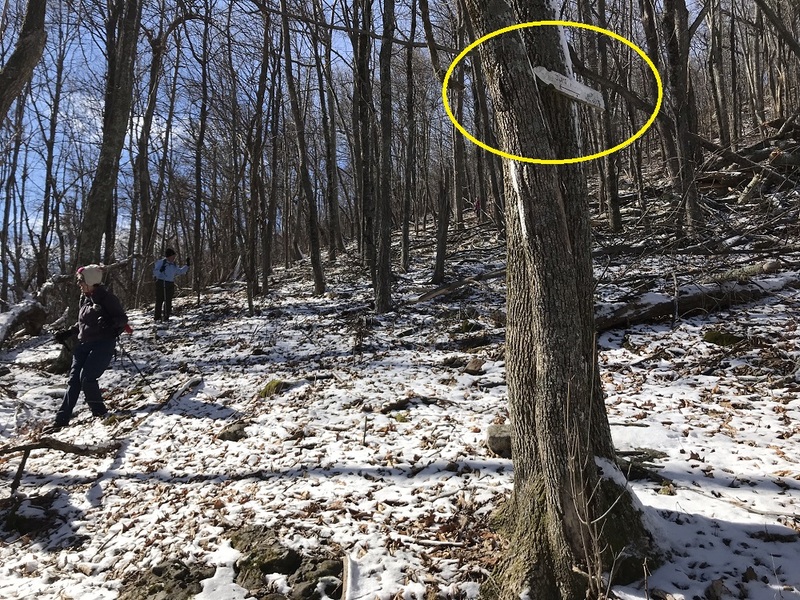 There is a sign that has fallen off a tree there so you are not sure which way to go and there are white blazes on both trails. Take the trail to the right. You then start to climb quite a bit and eventually reach quite a barrier of large rock outcrops and the trail seems to disappear here. 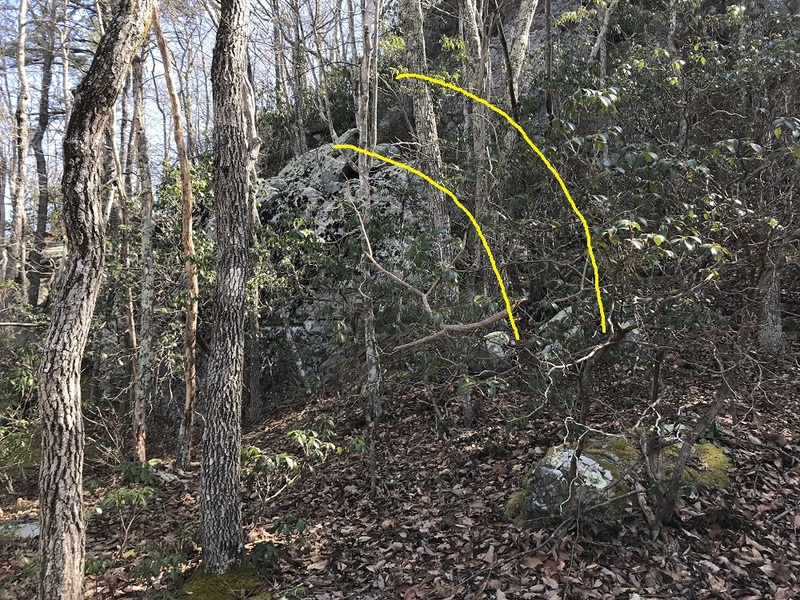 You can go straight over the rocks but for the less youthful there is an easier route just about ten or fifteen yards to the left so I suggest you bear left when you hit the steep rocks and you will see a much easier spot to go over the rocks and then hit the trail again. on the other side. 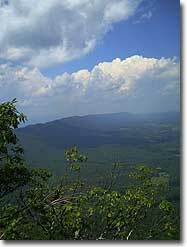 You keep going up and pretty soon you will hit a set of big rocks where you can look over into the Shenandoah Valley for the first time on this hike. Someone has thoughtfully hung two gallon water bottles up in a white netting which can easily be lowered if you are out of water or forgot to bring any.This is a good spot to sit and eat. There is another one in about 20 minutes if you want to wait. From these rocks you leave to the left of them on a trail and follow it until it starts going down quite steeply to the right. you will see two or three white blazes and then there are none and the trail disappears. Do not despair. You can see a saddle between the ridges down bearing a bit to the left so just keep descending the direction you were going until you hit a trail which is coming in from the left. Follow this down to the saddle. There is a piece of debris from a previous structure in a small moss-covered clearing there to sit on and have lunch. At this point there is a sign saying you are 0.5 miles from Jump Rock. Follow the trail up to Jump Rock...it is well-marked and you will know it when you have gotten to Jump Rock. 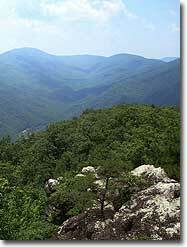 You emerge from the trail on to some rocks overlooking the Shenandoah along Little North Mountain. It is a great place to sit and enjoy the view, look into the Valley below, have a lunch if you haven't already, watch the hawks flying beneath you and enjoying the peace and quiet. You backtrack 0.5 miles down to the spot where the small clearing is and then continue up the trail where you met it after bushwhacking for a hundred yards or so coming down the steep part to the saddle. Keep going along the trail across a steep slope as you cross over a rocky debris field. If you look down slope you will see other trails and blazes but do not try to reach those...stay up on slope crossing across it (there is a trail with blazes across a lot of rocks) and you will eventually start dropping onto a clear well-marked trail. This is a the Tuscarora Trail, but it is not marked as such until you make a left turn off of it. When you see a sign called "Viewing Rock Trail" pointing off to the left, take this trail to the left. 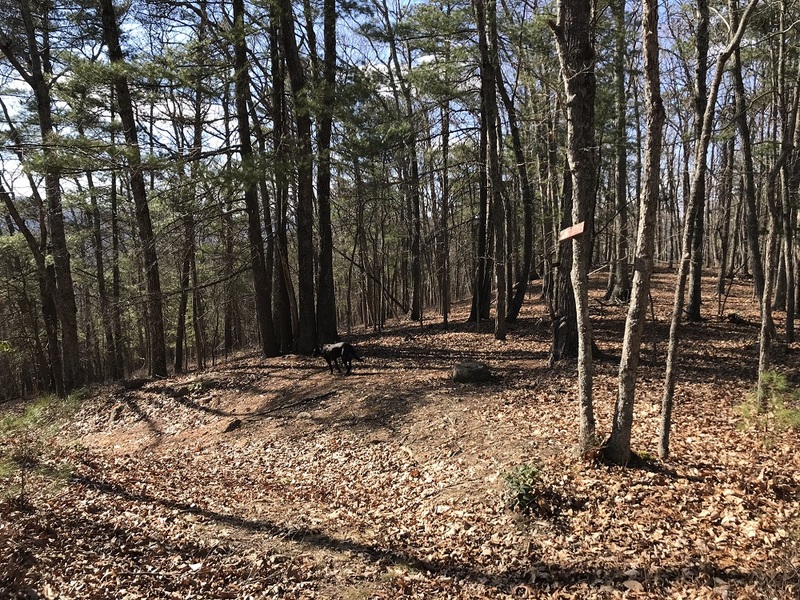 It starts to drop steeply and in about 150 yards you will see a small trail and a sign pointing to the left where in about 20 yards you will get to the Viewing Rock with a great view of Lake Merriwether and the valley to the West. Walk back out to Viewing Rock Trail and then immediately you hit a sign that points you to Camp PMI. DO NOT ignore this sign. Take this trail towards Camp PMI. (Note that the primary notes say not to follow it...you should definitely follow it, we believe it must have been in a different place previously). Keep going down (quite steeply) on this trail and you will hit an intersection with a sign pointing to the left saying "Hunter's Trail". 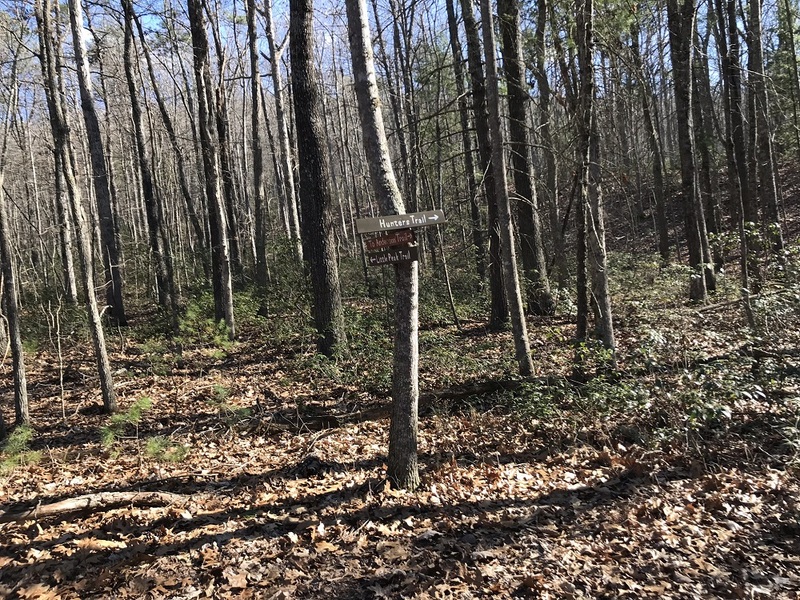 Take a left here and soon you will hit an old logging road which goes down to the right on Round Knob Trail. From here it is easy sailing 2.7 miles back to the swinging bridge. Keep going on this and you will hit a small creek going through an old steel pipe under the trail and continue descending until you hit a gravel road. Take a left on the gravel road and you are now on the edge of Camp Bowman (on your right). You will see camp sites for the scouts in the woods. Keep going along the gravel road until you see Lake Merriwether in front of you a hundred yards ahead of you. We did not take the Anderson Trail sign on our left (and are not sure where this leads). We took a left soon after it before we hit the lake at a shooting range. There is a gravel/dirt road here that runs along the base of the mountain and eventually hooks up again with the trail (take a right on the trail) and it will take you back to the Swinging Bridge. We never saw any signs for the Swinging Bridge. Really enjoyed this hike but it was a bit stressful at times not knowing exactly where to go...hope this helps to make it easier for you. The description is pretty spot on and navigating was not difficult. There were several fallen trees and trail signs. The bushwack had us nervous ahead of time, but we stayed on the ENE heading when the white blazes ceased and located the trail to take us up to Jump Mountain, which was clearly marked, but overgrown. Coming back down Jump Mountain towards Viewing Rock was marked by white blazes, but not very packed down in places. Just past Viewing Rock, there was a sign that said “To Camp PMI,” which had us second guessing whether or not to continue down Viewing Rock Trail. We continued down Viewing Rock Trail and made it down to the intersection where we were took the "hard left onto an un-named trail," which was now marked as Hunters Trail. One last note - the green sign indicating the return to Swinging Bridge was not there or we missed it, so be alert. Overall a moderately strenuous but beautiful hike on an early spring day.